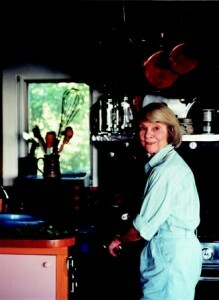 Food lovers and the literary world owe a debt of gratitude to Judith Jones. For me, I will be forever grateful to Jones for seeing the possibilities in Mastering the Art of French Cooking. Julia Child is one of my personal heroes, and if Jones hadn’t championed her efforts, we may never have met this dynamic cook. In her honor, and because cherries are coming into season, I decided to make Clafouti from Mastering. The aroma of cherries and vanilla filled our apartment as it baked. Though not the prettiest dessert, which may be why the recipe calls for a dusting of powdered sugar over the top, the flavor was wonderful. Its texture is somewhere between custard and a tart. The whole cherries make it a little difficult to cut, but plunge ahead and don’t worry about the look. The taste is worth it! I served it warm as a dessert, but I saw other cooks suggest eating it for breakfast. Can’t wait for tomorrow morning to get here. On the other hand, maybe I’ll just have seconds. Adapted from Mastering the Art of French Cooking by Julia Child, Simone Beck, and Louisette Bertholle. Pour a 1/4-inch layer of batter into the baking dish. Place into the oven a bake until just set, about 5 minutes. Remove from the oven and add the cherries. Sprinkle the remaining 1/3 cup sugar over the top, and then pour on the rest of the batter. Place the dish back into the oven and bake until the clafouti is buffed and browned, and a knife placed in the center comes out clean. The cookbook says it should take about an hour. Mine took 45 minutes, so keep an eye on it! Clafouti should be served warm with a dusting of powdered sugar. Oh I think I just may have to run out and get some cherries! Looks good!! I haven't been following the Gourmet Game Changers list but I must say, there are a few on that list which I do admire and Judith Jones is certainly one of them. As you say Linda, she is sometimes in the shadows so I am delighted to see a tribute to her and some of her accomplishments. I adore Judith Jones' attitude and adventurous spirit ... her autobiography/memoir 'The Tenth Muse- My Life in Food' is an excellent read ...your clafouti is the perfect dish for this time of year! Cherries are plentiful right now! Just gorgeous, Linda! Enjoy! I've never heard of Judith Jones, but I'll think of her next time I eat chaflauti—which may be soon.